I love taking a peek into other artist’s creative spaces and getting ideas for storage and layouts. A studio can be a retreat and private place for an artist. Not only does creativity happen there, but healing and restoration can happen too. 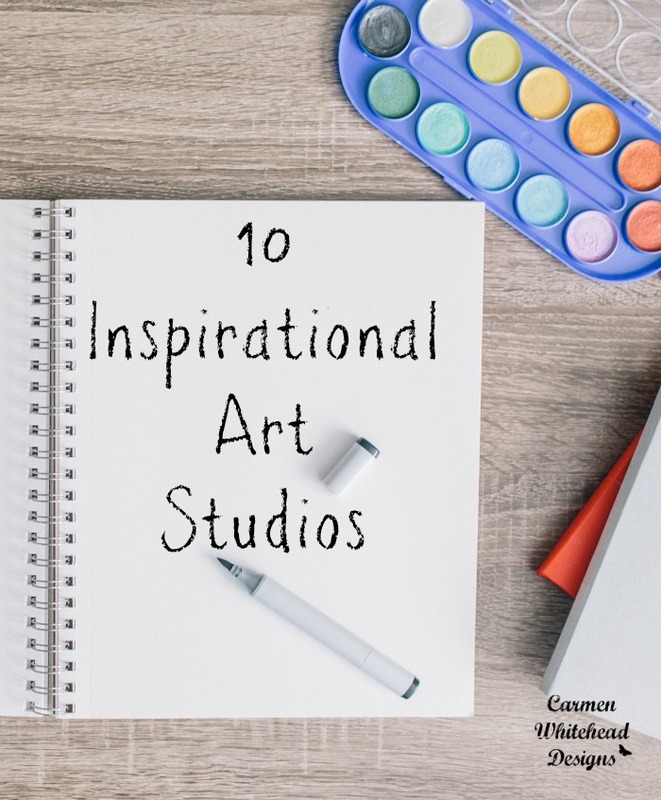 Today I’m sharing with you 10 inspirational art studios that I found from some of my favorite artists. The Breezy Tulip Studio has the right idea of getting the creative juices flowing with some Spice Rooibus Tea. This is perfect for this time of the season. I love all the light and wall space in Michelle Allen’s space! It’s incredible to me that the very talented Katie Daisy creates her beautiful flowers from this small desk! Goes to show you that you truly don’t need a huge space to create. Blenda Tyvoll of Blenda Studio has the best of both worlds, a working studio where she creates and also doubles as her shop. I especially love her shop helper Georgie behind the counter. Jeanne Oliver has a love of vintage items like I do and has incorporated them into her studio beautifully! Kelly Rae Roberts has been a long time inspiration to me and her newest studio is absolutely brilliant! Converted from an old school room (complete with a blackboard!) it’s big enough for creating, teaching and running a business. Mae Chevrette has an incredible studio in Boston with big windows and lots of floor space for big canvases. She’s also a very talented photographer. Cathe Holden probably takes the cake for the most transformed space, a barn to a studio! But, I’m really wanting that retro-green sofa! She conducts classes in her space also, but she’s got some really unique storage solutions too. Tammy Tutterow offers some great storage suggestions for all those stamps, die cuts and inks you may have and she does it vintage items too! Sara from The Rosy Life has the cutest little spot for a creative space! She truly makes the most of the space she has and shares it with beautiful photography. There you have them! 10 spaces that I find inspirational in different ways and take away ideas from each one of them. Remember you don’t need a big space, expensive or new furniture. Use what you have and the creativity will flow. UPDATE: I’ve recently added 10 More Inspiring Created Spaces, make sure you check them out! I’ll be sharing my own space soon, so stay tuned! Carmen, I love seeing creative spaces! Each one is just a delight. Big or small, having your own space is fabulous! Thanks for sharing with SYC. You’re very welcome Sara! I so enjoy your posts and absolutely love your style of photography! Really cool post! I don’t consider myself an artist, but I am intrigued by their mindset and deep pools of creativity… seeing where they get cranking is so interesting! I’m loving that green sofa! Also (sorry to be weird and replying to my own comment) but GASP! I LOVE your artwork!! How amazing.